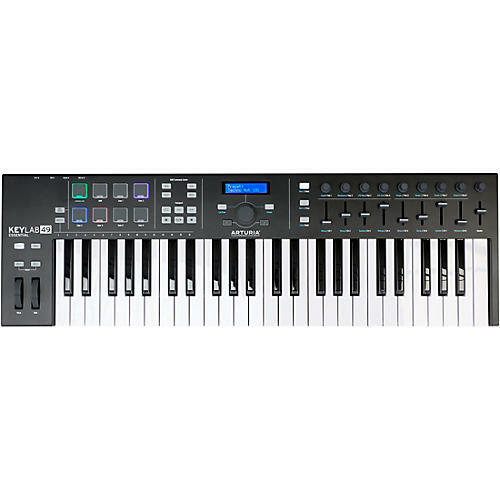 The Arturia Black KeyLab 49 Essential is an affordable, full-featured MIDI controller keyboard offering DAW control, custom maps, great integration, and amazing bundled software including the full version of Arturia’s award winning Analog Lab 3. The perfect controller for getting new producers up and running, or a superb addition to any pro’s setup, Black KeyLab Essential 49 gives you maximum bang for your buck. Its selection of faders, rotary knobs, performance pads, and that all important, super-playable keyboard make sure every element of your sound is right at your fingertips. When you’re getting creative, you don’t want technology interfering with your flow. Almost everyone starts off by using the computer keyboard and mouse to change settings and edit sounds, but now you’re ready to take the next step. Once you discover how quick and intuitive Black KeyLab Essential 49 makes controlling your sound and recording process, you’ll wonder how you ever worked without it. The powerful map settings effectively make this 8 controllers in one, so whatever collection of rack synths, virtual instruments, sound modules, or recording software you’ve decked your studio out in, Black KeyLab Essential 49 will make you the master of it all. You’ll be totally blown away by how much is possible when this affordable controller is teamed up with the Arturia MIDI Control Center. Whether you’re a Mac pro, a Windows expert, or need to stay in control on the move with your phone or tablet, Black KeyLab Essential 49 is your perfect partner in crime. Using just one USB socket to transmit MIDI and receive power, you won’t be swamped with wires, and Black KeyLab Essential 49 is also class compliant, meaning that - put simply - it just works. There’s even a MIDI Out port to connect it directly to external hardware or modules. Black KeyLab Essential 49 also lets you get hands-on with your DAW. Featuring a dedicated DAW Command Center, all of the most frequently used functions and transport control features are laid out before you. You can use the rotaries and faders to adjust levels and mix your track in your DAW, or tweak the parameters of a virtual instrument. The possibilities are almost endless. Inside the box, you’ll also find a downloadable copy of Arturia’s award winning Analog Lab 3, a collection of over 6,500 incredible presets from the award-winning V Collection software package. Analog synths, electric pianos, organs, string machines, digital synths, acoustic pianos, all perfectly programmed by some of the most talented, experienced sound designers in the industry. You’ll also receive Ableton Live Lite, an introduction to one of the most widely used recording and performing software platforms on the planet. Coupled with the addition of UVI’s Grand Piano Model D virtual instrument, you’ll have everything you need to start creating music. Even on its own, KeyLab Essential is incredible value for money. Combined with this outstanding collection of software, it truly is an inspirational one-box solution for recording, producing, and performing. Nothing else comes close in its category.